Display iTunes track information in Notification Center. Is there a better alternative to iTunification? Is iTunification really the best app in Audio category? Will iTunification work good on macOS 10.13.4? iTunification makes it so you don't have to switch to iTunes again. You can see your music right where you are.When you play songs in iTunes or Spotify, iTunification gets the track's details and shows them in OS X 10.8 new Notification Center or Growl. Your choice! iTunification only supports OS X 10.8 and above since previous versions of OS X do not have a Notification Center. Show notifications when a music track starts playing in iTunes and Spotify. 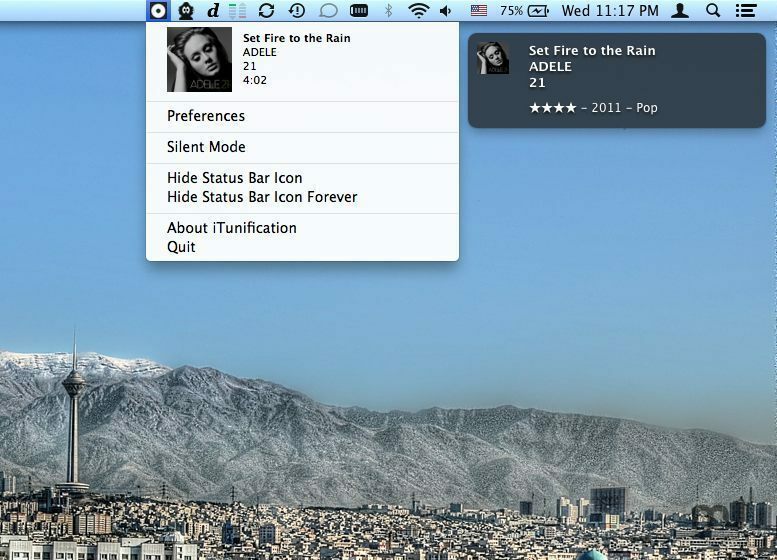 Show the current track's details and artwork in status bar. Added Feature: Song details are shown in status bar. Added Feature: Added option to keep a history of notifications in Notification Center. Added Feature: Added option not to show notifications when music player is active. Bug Fixed: A bug is fixed where cover arts did not load for some songs. Bug Fixed: Memory leakage with Growl notifications is solved. Users choose Growl or Notification Center to show their notifications. Cover art is available and notifications are customizable when Growl is in use. Silent mode to prevent the application from bothering the user with notifications. An option to keep a history of songs played in Notification Center. An option not to show notifications when the music player is the active window. An option to make iTunification start when the system starts. Visit iTunification's source code and report bugs in it's Github directory. You are also welcome to email me your comments via a.rabbani@me.com. Bug Fixed: A bug is fixed where selecting notifications opened iTunes instead of Spotify.